Throughout Minnesota, from Austin to International Falls, people flock every year to more festivals–county fairs, arts and craft shows, ice-fishing contests, and music festivals–than you can shake a stick at. Most come for the food and fun, but a few festival-goers have more devious intentions in mind. In this diverse collection of short stories, members of Twin Cities Sisters in Crime reveal the chilly underside of dog-sled races, gang rivalries at a Cinco de Mayo festivals, errant ice picks at a winter sculpture park, arson at a North Shore boat show, and a host of other ticklish and terrifying situations. Sometimes humorous and always rich in local color, these mysteries abound in psychopaths and twisted cops, cagey con men and shrewd amateur sleuths. They’ll keep you guessing ’til the band stops playing and the final light goes out. Festival Of Crime is a fun and fast-paced delight. 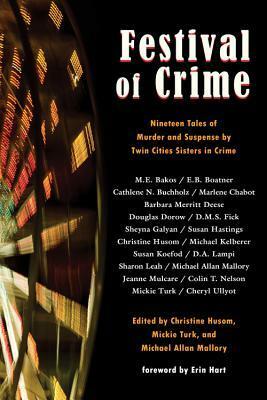 These short stories, featuring murder, thievery, scheming, and suspense are set in and around Minnesota’s abundant festivals. Read them and realize that those blood-curdling screams you hear may not be coming from thrill seekers on carnival rides, after all. If you enjoy treading along the dark side of (presumably) happy gatherings, then this book is for you. Don’t miss it.